PocketBook InkPad - 8-inch premium E Ink e-reader with LED frontlight for the most comfortable reading day and night long. PocketBook InkPad 8 inches allows to see more information at a single page - you can easily make the font larger and turn pages frequently. PocketBook InkPad - the best choice for reading professional literature, periodicals, work with graphs and tables including PDF and Djvu. 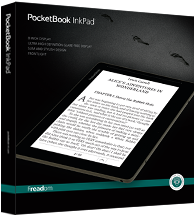 PocketBook InkPad is perfect for reading both at the workplace and at home. School and college students will appreciate e-reader of such a format, because the 8-inch screen is the closest to the standard size of most textbooks. 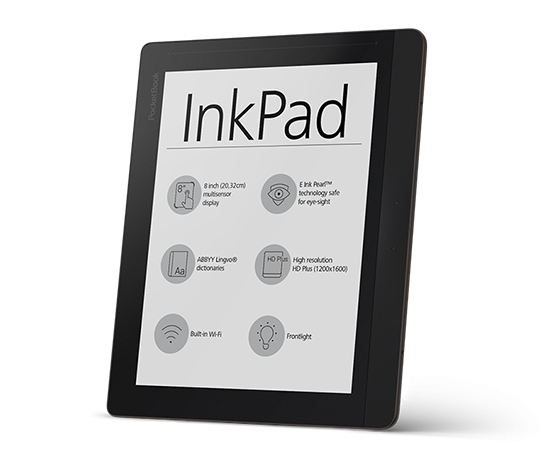 PocketBook InkPad screen is based on E Ink Pearl technology, and has the highest screen resolution among such devices - 1600x1200 pixels. High resolution allows to adjust the font size from the minimum to the maximum without losing definition. Exceptional image clarity will provide special reading comfort, and the property of E Ink screens to use only reflected light, makes reading perfectly safe for eyes. LED frontlight allows to read even in low light conditions. PocketBook InkPad is made in the new design - smooth monolithic faceplate of brushed anti-reflective material provides luster and elegance. A rubberized band with turn page buttons situated to the right of the screen makes using the device more convenient and also highlights the elegant style of the e-reader. Dimensions are 162.8 x 195.5 mm and the width of the device is just 7.3 mm. A powerful 1GHz CPU and 512MB of RAM provide smooth pages turning and stable use of any application. 4 GB of internal memory expandable up to 32 GB will allow to collect favorite books in a large library, which is always at fingertips. Capacious 2500 mAh battery provides weeks without recharging. PocketBook InkPad harmoniously combines features and functions with a single purpose - to provide the greatest opportunity for comfortable reading in any environment. Text-To-Speech, as well as MP3 support allows to listen to your favorite books and other audio files while built-in ABBYY Lingvo dictionaries are invaluable in the study of foreign languages. Built-in Wi-Fi opens up limitless opportunities to discuss favorite books in social networks using ReadRate. Integrated Dropbox, Send to PocketBook and PocketBook Sync services will allow to synchronize and transfer content to the device without connecting to a PC. PocketBook InkPad with its sophisticated design and latest solutions - a combination that will allow to get real reading pleasure.